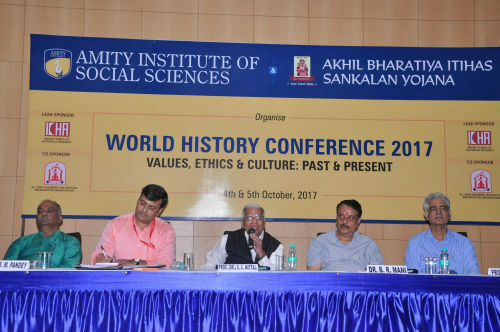 Noida: Amity Institute of Social Sciences (AISS) in association with ‘Akhil Bhartiya Itihas Sankalan Yojna’ started two day “World History Conference” on “Values, Ethics and Culture: Past and Present” at Amity University Uttar Pradesh, Noida Campus. The Conference aims at understanding the changing paradigm resulting out of the failure of values, ethics and culture in providing solutions to International problems of mankind. Prof. (Dr.) Saurabh Agarwal, Professor & Dean, Indian Institute of Finance; Dr. B R Mani, Director General, National Museum, New Delhi, Prof. B M Pandey, General Secretary, Akhil Bhartiya Itihas Sankalan Yojana, Dr. Om Jee Upadhyay- Assistant Director, ICHR and Prof (Dr.) S C Mittal ,President, Akhil Bhartiya Itihas Sankalan Yojana inaugurated the Conference. Welcoming the distinguished gathering, Prof. (Dr.) Nirupama Prakash, Director, Amity Institute of Social Sciences (AISS) shared that Amity gives high importance to values, ethics and sanskaars and throughout the year, students are encouraged to undertake activities, promoting the same amongst them. She informed that Conference is being attended by more than 200 historians and academicians and expressed her hope that the proceedings of the Conference will re-inforce the importance and relevance of the theme of the Workshop. Prof(Dr.)S C Mittal ,President, Akhil Bhartiya Itihas Sankalan Yojana, while addressing the gathering, stressed that values, ethics and culture are the center points of all religions in India be it Hinduism, Jainism or Sikhism. He expressed that culture binds people together and weave them around a common thread. Talking about religion, he remarked that religion is a duty and a way of life which cannot be taught in educational institutions. He opined that religion is eternal and universal truth and Western philosophy ends where Eastern philosophy starts since Eastern Philosophy talks about life after death, moksha and salvation. Addressing the gathering, Prof. (Dr.) Saurabh Agarwal, Professor & Dean, Indian Institute of Finance stated that according to Indian religious scriptures, human beings are living in the Kalyuga which is perceived to be devoid of culture, values and ethics. He stressed that human beings have the potential to bring about a change and change the way the future will be seen by the coming generations. He opined that knowledge alone is not enough to bring about a change, it needs to be coupled with values and ethics which will ensure the sustainability of the change. Prof. B M Pandey, General Secretary, Akhil Bhartiya Itihas Sankalan Yojana, stated that due to repeated invasions, the age old knowledge of India lost its sanctity, the scriptures were translated from Sanskrit to Parsi and finally, in English which robbed the scriptures of their true essence. He stressed that today, India is looking up to West for knowledge; the flow of knowledge which originally is from “East to West” is now being perceived from “West to East”. He called upon the gathering to re-instate belief in rich Indian values, ethics and culture. Sharing his views, Dr. Omjee Upadhyay- Assistant Director, ICHR stressed that Indian culture is an amalgamation of religious beliefs, culture and it’s simply a way of life. He stressed that civilization is what human beings do and culture is what they are. He opined that the roots of human existence are in religion and the farther human beings drift from religion, the more difficulties and problems they are likely to face. He averred that the problems faced by world will decrease if human beings will follow religion and its tenets. Conference Proceedings containing 15 research papers and 60 Abstracts, contributed by researchers across the world, was released during the occasion. The book “Religion Thy Relevance” edited by Prof. (Dr.) Veenus Jain- Convener of the Conference, AISS was also released.